Search Freehold Boro homes for sale and homes in Freehold. Freehold Boro is the county seat of Monmouth County. In 1919 voters decided to separate the downtown area from the surrounding farmland areas and thus created Freehold Boro, which is totally surrounded by Freehold Township. Furthermore, land was donated that was suitable for a courthouse, and a village of homes in Freehold quickly grew around the courthouse. Small businesses soon followed, and farms began to appear in the surrounding area. The two towns now have many shared services, but remain completely independent. Freehold’s history has many ties to the American Revolution. In fact, it was known as a center of patriot activity. The Declaration of Independence was read aloud from the steps of the Monmouth Courthouse just days after being signed in Philadelphia. 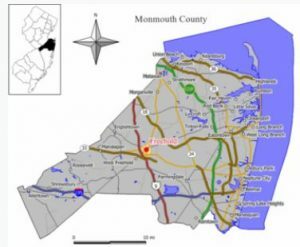 During the Revolutionary War The Battle of Monmouth was fought in what is now Monmouth Battlefield State Park. This is in Freehold Twp and Manalapan. A famous figure at the Battle of Monmouth was Molly Pitcher. In 1852 a railroad station was established in Freehold, contributing to Freehold becoming an important commercial and industrial hub in central New Jersey. The train now has limited usage for freight only. According to the 2010 Census, the population of the homes in Freehold Boro was 12,052. Of the over 4,200 Freehold Boro homes, most are single family homes. Three condo complexes are also in town. Many of the Freehold Boro homes in the downtown area date to the 1800’s, mostly around the courthouse, the Hall of Records and the train station. The median household income in Freehold Boro was $52,000. When kindergarten through 8th grade students enter school they will attend one of the three Freehold Boro Schools. A private school in town is St Rose in Freehold Borough. Other nearby schools are St John is Matawan, CBA in Middletown, Red Bank Catholic in Red Bank – among others. And when they enter high school, children from homes in Freehold Boro will attend the Freehold Regional High School District. There are six high schools comprising the Freehold Regional High School District. The schools are Manalapan, Freehold Township, Colts Neck, Freehold, Howell and Marlboro. Children will attend the high school according to boundaries set by the district. Students in Freehold Boro will attend Freehold High School. Each of the six high schools has specialized Learning Centers. As a result, students who are talented and highly motivated are eligible to enroll through a competitive admission process. The programs in the Freehold Boro Specialized Learning Centers offer are medical sciences, culinary arts/hospitality management in addition to a computer science academy. The remaining schools each offer different programs. More than 87 percent of the district’s students continue on to higher education. The students at all of the high schools usually excel because they consistently score in the SATs above the state and national averages. In the area you can enjoy live music at the Freehold Raceway Mall Summer Concert Series. Freehold Boro puts on a weekly free summer concert series. There are also concerts at iPlay America, an indoor Theme Park. Nearby in Red Bank visit the Count Basie Theater for concerts and shows. Or you can watch plays at the Two River Theater. Freehold Boro has a great Memorial Day Parade, in addition to other festivals throughout the year. You can visit the movie theaters in Raceway Mall and on Route 9. Don’t miss the fireworks display at Freehold Raceway. You can go to the races which feature live harness racing for trotters and pacers. New York City is less than 2 hours away by car, or you can take a bus or catch a train from Matawan. If you prefer, Atlantic City is less than 2 hours drive. For commuters, NJ Transit and Academy Bus offer service to NYC with stops along Route 9 and at the train station in downtown Freehold. However, there is no regular train service in town. Even so, commuter train service is available in nearby Matawan.